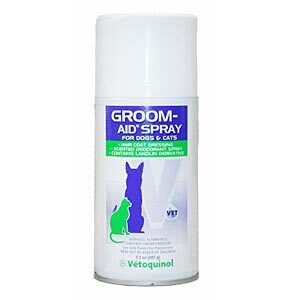 Groom-Aid is a fragranced spray for dogs and cats that removes tangles from you pet's coat after bathing or before grooming. Detangling, deodorizing and moisturizing, it adds luster and sheen while making the coat easier to brush. Non-greasy and quick-absorbing, it can be used after every bath to remove odors from the coat. Hold can upright, about 8 to 12 inches from pet’s hair. Point opening on side of valve in desired direction for spray. Spray over the entire animal, using a “Zig-Zag” motion, until the coat is slightly damp. On long haired animals, to rub the hand against the lay of the hair and spray into hair behind hand. Do not use or store near heat, sparks or open flame. Do not puncture or incinerate container. Do not expose to heat or store at temperatures above 120°F.